Before opening this year's MTV Video Music Awards, Cardi B teams up with singer Kehlani in her new video for her single "Ring," the newest release from her debut album, Invasion Of Privacy. However, the video dropped this morning unbeknownst to Bardi. She said she was pissed no one told her the video would be released today because she would have at least promoted some before it was released to the masses. She also said she didn't approve any final edits of the video, but she's going with the flow of things instead of ranting about it. In the clip, Blonde Bardi raps about a man who no longer hits her line anymore while in a floating telephone booth over an ocean in the Mike Ho-directed video. It's reported she was five months pregnant when she shot the video. 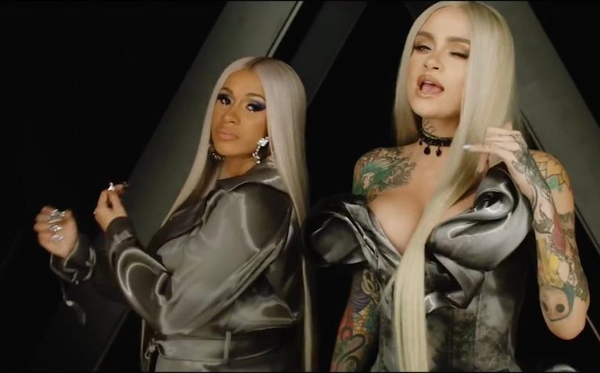 Meanwhile, Kehlani, also rocking blonde tresses, provides the song's hook while all tangled up in the telephone wires with Kulture's mom. "Ring" is Cardi's 5th single from the her debut album, following "Bodak Yellow," "Bartier Cardi," Be Careful," and "I Like It." The new mom will be launching her own Fashion Nova collection in November. And to celebrate, she's gearing up to host a launch party where she and others will perform. Fashion Nova CEO Richard Saghian spilled some tea to TMZ, saying she may even premiere brand new music at the launch. Nothing is set in stone just yet, but Saghian said he anticipates Cardi will be dropping a new single at the pary, which will stream live on Fashion Nova's website. We all know Cardi loves her Fashion Nova 'fits. It's being reported Cardi will open the 2018 MTV Video Music Awards (she's not performing though). She's starring in some sort of skit or she'll appear in a monologue. She's in the running for 10 awards, including Best Video, Best Song and Artist of the year. Also, she's set to hit the stage for her first post-pregnancy performance at the 2018 Mala Luna Festival in San Antonio, TX on October 27th & 28th.